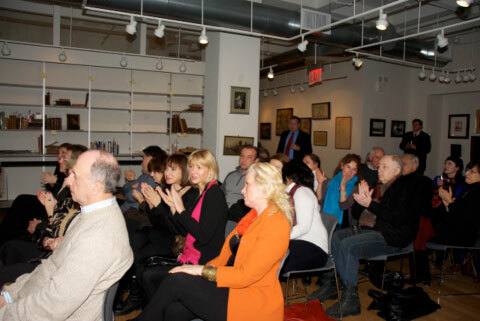 On Friday evening, the 28th of January, a wonderful evening of contemporary jazz was organized at the Bloomsbury Auction House near 5th Avenue on 48th Street. 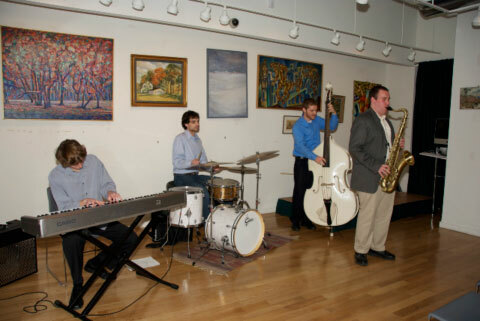 The David Zaks Quartet – from left, to right: David Zaks, keyboard; John Czolacz, drums; Dan Filipak, bass; and Dylan Anderson, saxophone. Jazz phenom David Zaks has performed at Carnegie Hall, Cecil’s Jazz Club, Smoke, the New Jersey Performing Arts Center, and Chico’s House of Jazz. He was a guest on the WBGO jazz station and played a prelude performance for an exclusive metro-area engagement by Lang Lang and Herbie Hancock. The evening was extremely well attended and well received. Guests of MoRA enjoying an evening of contemporary jazz. 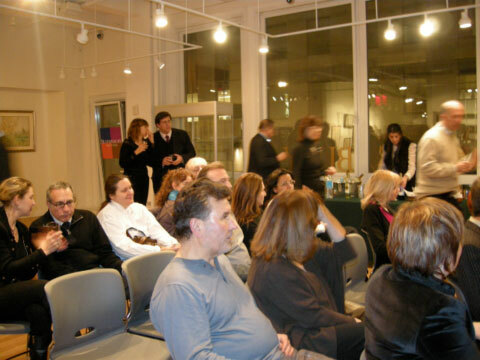 The jazz was accompanied by artworks provided by the MoRA’s Directors, friends and supporters. From left to right: Michael Shustarovich, MoRA Director; Valerie Kalmanovich of Bloomsbury Auctions; Margo Grant, MoRA Director. The quartet emerged from William Paterson’s renowned jazz program. Dylan Anderson is a graduate of Michigan’s renowned Interlochen Arts Academy and has played with such jazz luminaries as Peter Erskine, Chris Brubeck, Xavier Davis, and Robin Eubanks. Dan Filipak studied both classical music and jazz with the famed bassist Mike Richmond. He is currently working under another bass great, Steve LaSpina. John Czolacz has performed extensively in the New York/New Jersey area. Regulars at Shanghai Jazz, Cecil’s, Trumpets, Miles Cafe, Puppet’s Jazz Bar, and other prestigious venues have come to appreciate his work. More MoRA guests enjoying the jazz and artworks. MoRA’s initial evening of jazz was a great success and a wonderful step towards creating an interested and supportive MoRA community – may it be the first of many! For directions to MORA please click here. ©1980-2017 MORA museum. All rights reserved.